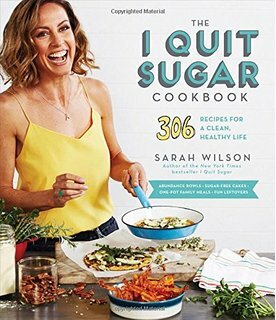 As someone who has heard of Sarah Wilson and her 'I Quit Sugar' movement, I have been wanting to read one of her books for a long time. While I haven't read her first book, I have had opportunity to read this one and devoured it from start to finish in one sitting! What a fantastic book and incredible resource! I am actually feeling excited about this whole idea. One thing that really impressed me is how she really has included every little thing you might need to do this. It's very easy to follow, and simple to read also. I love her added little handwritten thoughts throughout it - adding that extra personality to the book. For me, it answered lots of questions that have arisen from other things I've read - this book is very thorough! Okay so I have to say her whole no waste thing, while good in theory, grosses me out in parts. How she eats other people's leftovers from restaurants and pulls tea bags from the trash. The recipes using offal type things will also be avoided in my home - and yes I know she'll be pointing her finger at me shaking her head. Sarah definitely has a soapbox about wasted food and it is definitely an issue to be aware of but for me, going to the extremes she goes to, is not something I'd ever attain to! Anyway onto the rest of the book as that was only a small section. Sarah outlines which foods are best to buy organic, the type of things she uses in her kitchen (many of which are hand me downs or from the rubbish dump or second hand - again promoting reusing and less waste which is great). She discourages people going out to buy things but is very much for using what you already have. One section that was particularly helpful for me was how to store food - prepping for the freezer, how to store different things for lasting value in the fridge, what needs to be par cooked or what can be frozen as it is etc. I love, love, love her section within that section about the uses for the ice cube trays. I've seen things along those lines on pinterest but this took it even further and was really really useful and I could see myself doing it also. She includes how to make your own cream cheese, how to make kombucha, kimchi and how to ferment your own veggies - things I've heard about and been interested in for a while and here they all are, easy to read and follow in one book. Perfect! And it has a pretty amazing dessert section too - oops I shouldn't be focussing on that right? Interspersed throughout this book was also really great information on different things you might come across, like the difference between the difference greens, or tips on how to use, benefits, where the info came from etc. In summary, I have to say, I would definitely recommend this book to anyone wanting change in their current eating environment or habits. I am even more intrigued now on what is in the first book she wrote. This book doesn't appear to follow on from the other book - for me, not reading the first book, I didn't feel like I had missed anything. She didn't make any references to that book that I noticed anyway. Please note that Blogging For Books sent me a copy of this book, however my review is entirely my own.